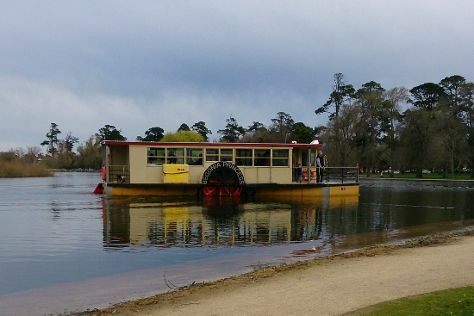 Eschew the tourist crowds and head to Lake Wendouree and Lake Daylesford. You'll find plenty of places to visit near Melbourne: Geelong (Eastern Beach Reserve & The Food Purveyor), Ballarat (Ballarat Botanical Gardens, Art Gallery of Ballarat, & more) and Wombat Hill Botanical Gardens (in Daylesford). Dedicate the 30th (Tue) to wine at some of the top wineries in the area. Spend the 2nd (Thu) exploring nature at Point Nepean National Park. And it doesn't end there: stroll around Royal Botanic Gardens, brush up on your military savvy at Shrine of Remembrance, explore and take pictures at The Great Ocean Road, and tour the pleasant surroundings at Bells Beach. To find maps, reviews, other places to visit, and tourist information, read our Melbourne journey maker app . Use the Route module to see travel options from your home to Melbourne. April in Melbourne sees daily highs of 23°C and lows of 11°C at night. Wrap up your sightseeing on the 2nd (Thu) to allow time to travel to Charleville. Charleville is a town and locality in the Shire of Murweh, Queensland, Australia. Kick off your visit on the 3rd (Fri): see the interesting displays at Historic House and Museum, then identify plant and animal life at Charleville Bilby Experience, then get engrossed in the history at Royal Flying Doctor Hangar Visitor Centre, and finally look and learn at Charleville Cosmos Centre & Observatory. To see photos, maps, traveler tips, and tourist information, refer to the Charleville trip itinerary planning tool . Explore your travel options from Melbourne to Charleville with the Route module. When traveling from Melbourne in May, plan for a bit warmer days and about the same nights in Charleville: temperatures range from 29°C by day to 11°C at night. Wrap up your sightseeing by early afternoon on the 4th (Sat) to allow time for travel back home.